(1) Chen YH*, Chen YJ, Chou CY, Wen CC, Cheng CC* (2019) UV-protective activities of pineapple leaves extract in zebrafish embryos. Research on Chemical Intermediates 45: 65-75. (2) Chen YH, Tai HY, Fu E, Don TM* (2019) Guided bone regeneration activity of different calcium phosphate/chitosan hybrid membrane. International Journal of Biological Macromolecules 126: 159-169. (3) Hsieh CS, Tsai CT, Chen YH, Chang SN, Hwang JJ, Chuang EY*, Wu IH* (2018) Global expression profiling identifies a novel hyaluronan synthases 2 gene in the pathogenesis of lower extremity varicose vein. Journal of Clinical Medicine 7: 537. (4) Tsai JN, Sun CY, Ding YJ, Wang YH, Lo KC, Weng CC, Lin JW, Chang CF, Hsu LS, Chen HM, Fong TH*, Chen YH* (2018) Embryonic exposure to 4-methylimidazole leads to zebrafish myofibril misalignment. Environmental Toxicology 33: 1821-1828. (5) Sun CY*, Wu MS, Lee CC, Chen SH, Lo KC, Chen YH* (2018) A novel SNP in the 5’ regulatory region of organic anion transporter 1 is associated with chronic kidney disease. Scientific Reports 8: 8085. (6) Chu HF, Chen CC, David M, Chen YH, Lin CH, Tsai YC, Chou CY (2018) Porcine epidemic diarrhea virus papain-like protease 2 can be noncompetitively inhibited by 6-thioguanine. Antiviral Research 158: 199-205. (7) Lin MH, Moses DC, Cheng SC, Chen YH, Sun CY*, Chou CY* (2018) Disulfiram can inhibit MERS and SARS coronavirus papain-like proteases via different modes. Antiviral Research 150: 155-163. (8) Lai YH#, Din YJ#, Moses D, Chen YH* (2017) Teratogenic effects of topiremate in a zebrafish model. International Journal of Molecular Sciences 18: 1721. (9) Chang CF, Hsu LS, Weng CY, Chen CK, Wang SY, Chou YH, Liu YY, Yuan ZX, Huang WY, Lin H, Chen YH, Tsai JN* (2016) STT3B-dependent N-glycosylation of human R-spondin 1 is required for efficient secretion but not for its heparin binding affinity. International Journal of Molecular Sciences 17: 937. (10) Yan D, Ni LK, Chen HL, Chen LC, Chen YH*, Cheng CC* (2016) Amphiphilic nanoparticles of resveratrol-norcantharidin to enhance the toxicity in zebrafish embryo. Bioorganic & Medicinal Chemistry Letters 26: 774-777. (11) Klionsky DJ*, Abdelmohsen K, Abe A, Abedin MJ, Abeliovich H, (…. ), Chen YH, et al., (2016) Guidelines for the use and interpretation of assays for monitoring autophagy. Autophagy 12: 1-222. (12) Chen YH*, Chang CY, Chang CF, Chen PC, Lee YT, Chern CY*, Tsai JN* (2015) Pro-angiogenic effects of chalcone derivatives in zebrafish embryos in vivo. Molecules 20: 12512-12524. (13) Chen YH*, Chang CF, Lai YY, Sun CY, Ding YJ, Tsai JN* (2015) von Hippel–Lindau gene plays a role during zebrafish pronephros development. In Vitro Cellular & Developmental Biology-Animal 51: 1023-1032. (15) Ding YJ, Wang BC, Wen CC, Sun CY, Lee HH, Lee FP, Yang LL*, Chen YH* (2015) Evaluation of the teratogenic effects of three traditional Chinese medicines, Si Jun Zi Tang, Liu Jun Zi Tang and Shenling Baizhu San, during zebrafish pronephros development. Journal of Toxicologic Pathology 28: 141-149. (16) Wu YC, Chang CY, Kao A, Hsi B, Chen YH*, Wang IJ* (2015) Hypoxia-induced retinal neovascularization in zebrafish embryos: a potential model of retinopathy of prematurity. PLoS One 10: e0126750. (17) Wu HJ, Fong TH, Chen SL, Wei JC, Wang IJ, Wen CC, Chang CY, Chen XG, Chen WY, Chen HM, Horng JL, Wang YH*, Chen YH* (2015) Perturbation of cytosolic calcium by 2-aminoethoxydiphenyl borate and caffeine affects zebrafish myofibril alignment. Journal of Applied Toxicology 35: 287-294. (18) Sun CY, Young GH, Hsieh YT, Chen YH, Wu MS, Wu VC, Lee JH, Lee CC* (2015) Protein-bound uremic toxins induce tissue remodeling by targeting the EGF receptor. Journal of the American Society of Nephrology 26: 281-290. (19) Ding YJ, Sun CY, Wen CC, Chen YH* (2015) Nephroprotective role of resveratrol and ursolic acid in aristolochic acid intoxicated zebrafish. Toxins 7: 97-109. 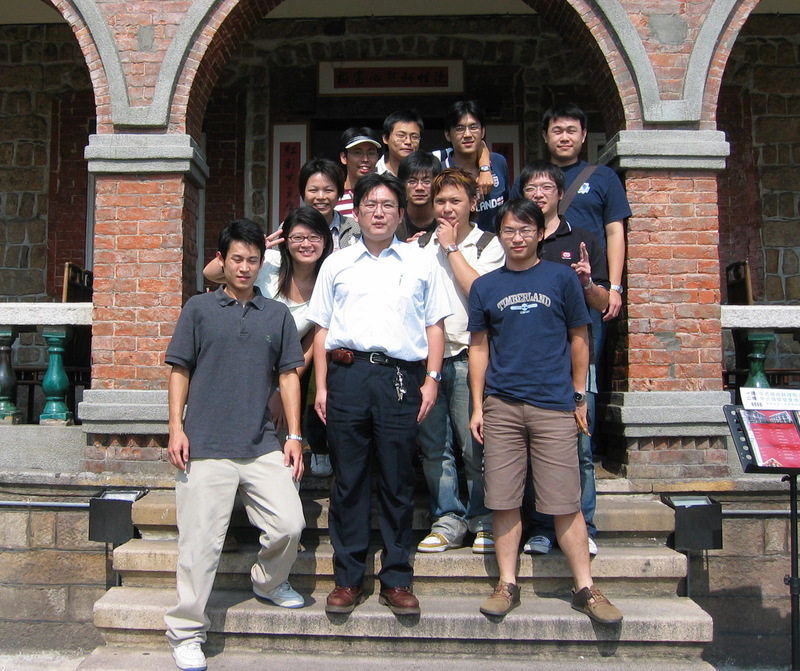 (20) Chang WN, Lee GH, Kao TT, Lin CY, Hsiao TH, Tsai JN, Chen BH, Chen YH, Wu HR, Tsai HJ, Fu TF* (2014) Knocking down 10-formyltetrahydrofolate dehydrogenase increased oxidative stress and impeded zebrafish embryogenesis by obstructing morphogenetic movement. Biochimica et Biophysica Acta-General Subjects 1840: 2340-2350. (21) Chen YH*, Lee YT, Wen CC, Chen YC, Chen YJ* (2014) Modeling pegylated liposomal doxorubicin-induced hand-foot syndrome and intestinal mucositis in zebrafish. OncoTargets and Therapy 7: 1169-1175. (22) Lo KC, Sun CY, Ding YJ, Tsai JN, Chang KP, Wen YE, Chang WL, Chang SC, Chang MF, Wang YH, Chen YH* (2014) Nephrotoxicity assessments of benzo(a)pyrene during zebrafish embryogenesis. Research on Chemical Intermediates 40: 2177-2185. (23) Cheng CC*, Chou CY, Chang YC, Wang HW, Wen CC, Chen YH* (2014) Protective role of comfrey leave extracts on UV-induced zebrafish fin damage. Journal of Toxicologic Pathology 27: 115-121. (24) Chen XG, Wang YH, Wen CC, Chen YH* (2014) Overdose of D-serine induces movement disorder and neuromuscular changes of zebrafish larvae. Journal of Toxicologic Pathology 27: 19-24. (25) Lee YT, Fong TH, Chen HM, Chang CY, Wang YH, Chern CY*, Chen YH* (2014) Toxicity assessments of chalcone and some synthetic chalcone analogues in a zebrafish model. Molecules 19: 641-650. (26) Chen YH, Pai CW, Huang SW, Chang SN, Lin LY, Chiang FT, Lin JL, Hwang JJ, Tsai CT* (2013) Inactivation of myosin binding protein C homolog in zebrafish as a model for human cardiac hypertrophy and diastolic dysfunction. Journal of the American Heart Association 2: e000231. (27) Ding YJ, Chen XG, Chen YH* (2013) Molecular structure and developmental expression of two zebrafish ankylosis progressive homolog (ankh) genes, ankha and ankhb. Russian Journal of Developmental Biology 44: 307-313. (29) Chen YH*, Wang WH, Wang YH, Lin ZY, Wen CC, Chern CY* (2013) Evaluation of anti-inflammatory effect of chalcone and chalcone analogues in a zebrafish model. Molecules 18: 2052-2060. (30) Wu CG, Cheng SC, Chen SC, Li JY, Fang YH, Chen YH, Chou CY* (2013) Mechanism for controlling the monomer-dimer conversion of SARS coronavirus main protease. Acta Crystallographica Section D-Biological Crystallography 69: 747-755. (31) Tsai IT, Chen YH, Chen YH*, Wang YH* (2013) Amikacin-induced fin reduction is mediated by autophagy. Journal of Toxicologic Pathology 26: 79-82. (32) Wu YC, Liu CY, Chen YH, Chen RF, Huang CJ, Wang IJ* (2012) Blood vessel epicardial substance (BVES) regulates epidermal tight junction integrity through atypical protein kinase C. Journal of Biological Chemistry 287: 39887-39897. (33) Shih TL*, Hsiao CA, Lin ZY, Chen YH* (2012) An alternative synthesis of 3’,4’-Diaminoflavones to evaluate their antioxidant ability and cell apoptosis of zebrafish larvae. Molecules 17: 8206-8216. (34) Jhou YR, Chiou CH, Ni LK, Chen LC, Chen YH, Cheng CC* (2012) Cellular uptake of a polypyridyl ruthenium complex revealed using a fluorescent rhodamine-modified ruthenium complex. Journal of the Chinese Chemical Society 59: 1053-1057. (35) Ding YJ, Chen YH* (2012) Developmental nephrotoxicity of aristolochic acid in a zebrafish model. Toxicology and Applied Pharmacology 261: 59-65. (36) Wu CK, Huang YT, Lee JK, Chiang LT, Chiang FT, Huang SW, Lin JL, Tseng CD, Chen YH*, Tsai CT* (2012) Cardiac myosin binding protein C and MAP-kinase activating death domain-containing gene polymorphisms and diastolic heart failure. PLoS One 7: e35242. (37) Chen YH*, Yang ZS, Wen CC, Chang YS, Wang PC*, Hsiao CA, Shih TL* (2012) Evaluation of the structure-activity relationship of flavonoids as antioxidants and toxicants of zebrafish larvae. Food Chemistry 134: 717-724. (38) Yeh CH, Liao YF, Chang CY, Tsai JN, Wang YH, Cheng CC, Wen CC, Chen YH* (2012) Caffeine treatment disturbs the angiogenesis of zebrafish larvae. Drug and Chemical Toxicology 35: 361-365. (39) Tsai IT, Yang ZS, Lin ZY, Wen CC, Cheng CC, Chen YH* (2012) Flavone is efficient to protect zebrafish fins from UV-induced damages. Drug and Chemical Toxicology 35: 341-346. (40) Chen YH, Tsai IT, Wen CC, Wang YH, Cheng CC, Hu SC, Chen YH* (2012) Fin reduction is a novel and unexpected teratogenic effect of amikacin-treated zebrafish embryos. Toxicology Mechanisms and Methods 22: 151-158. (42) Yang DC, Tsai CC, Liao YF, Fu HC, Tsay HJ, Huang TF, Chen YH*, Hung SC* (2011) twist controls skeletal development and dorsoventral patterning by regulating runx2 in zebrafish. PLoS One 6: e27324. (43) Yang DC, Yang MH, Tsai CC, Huang TF, Chen YH*, Hung SC* (2011) Hypoxia inhibits osteogenesis in human mesenchymal stem cells through direct regulation of RUNX2 by TWIST. PLoS One 6: e23965. (44) Lai YY, Pai CW, Tsai IT, Chou CY, Tsai CT*, Chen YH* (2011) Molecular structure and developmental expression of zebrafish atp2a genes. Genes & Genomics 33: 541-548. (45) Chang MY, Lu JK, Tian YC, Chen YC, Hung CC, Huang YH, Chen YH, Wu MS, Yang CW, Cheng YC* (2011) Inhibition of the P2X7 receptor reduces cystogenesis in PKD. Journal of the American Society of Nephrology 22: 1696-1706. (46) Liao YF, Chiou MC, Tsai JN, Wen CC, Wang YH, Cheng CC*, Chen YH* (2011) Resveratrol treatment attenuates the wound-induced inflammation in zebrafish larvae through the suppression of myeloperoxidase expression. Journal of Food and Drug Analysis 19: 167-173. (47) Ho MY, Chiou ML, Du WS, Chang FY, Chen YH, Weng YJ, Cheng CC* (2011) Inductive properties of polypyridyl ruthenium complexes significantly regulate various protein distributions in Escherichia coli. Journal of Inorganic Biochemistry 105: 902-910. (48) Chen YH, Chang CY, Wang YH, Wen CC, Chen YC, Hu SC, Yu DS, Chen YH* (2011) Embryonic exposure to diclofenac disturbs actin organization and leads to myofibril misalignment. Birth Defects Research Part B-Developmental and Reproductive Toxicology 92: 139-147. (49) Wen CC*, Huang SYH, Chen YH (2011) Cox regression for current status data with mismeasured covariates. Canadian Journal of Statistics-Revue Canadienne de Statistique 39: 73-88. (50) Chen YH*, Lin JS (2011) A novel zebrafish mutant with wavy-notochord: an effective biological index for monitoring the copper pollution of water from natural resources. Environmental Toxicology 26: 103-109. 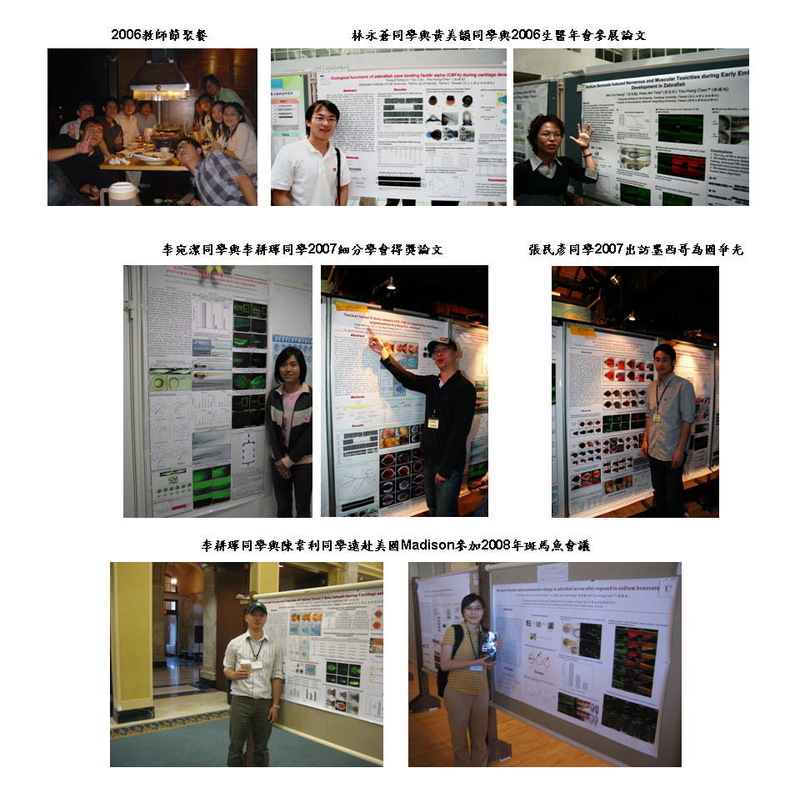 (51) Chen YH, Wen CC, Lin CY, Chou CY, Yang ZS, Wang YH* (2011) UV-Induced fin damage in zebrafish as a system for evaluating the chemopreventive potential of broccoli and cauliflower extracts. Toxicology Mechanisms and Methods 21: 63-69. (52) Chou CY*, Hsu CH, Wang YH, Chang MY, Chen LC, Cheng SC, Chen YH* (2011) Biochemical and structural properties of zebrafish Capsulin produced by Escherichia coli. Protein Expression and Purification 75: 21-27. (53) Chen YH*, Chiou CH, Chen WL, Jhou YR, Lee YT, Cheng CC* (2010) Rhodamine-ethylenediol, a novel vital fluorescent probe for labeling alkaline phosphatase-rich organelles. Journal of the Chinese Chemical Society 57: 1257-1261. (55) Pai CW, Chen YH* (2010) Transgenic expression of prothymosin alpha on zebrafish epidermal cells promotes proliferation and attenuates the UVB-induced apoptosis. Transgenic Research 19: 655-665. (56) Peng HC, Wang YH, Wen CC, Wang WH, Cheng CC, Chen YH* (2010) Nephrotoxicity assessments of acetaminophen during zebrafish embryogenesis. Comparative Biochemistry and Physiology C-Toxicology & Pharmacology 151: 480-486. (57) Ho MY, Chiou ML, Chang RC, Chen YH, Cheng CC* (2010) Outer membrane protein OmpF involved in the transportation of polypyridyl ruthenium complexes into Escherichia coli. Journal of Inorganic Biochemistry 104: 614-617. (58) Ho MY, Shieh YT, Liao CL, Chen YH, Cheng CC* (2009) Functional dihydro-1H-imidazole derivatives for MALDI signal enhancement of a lysine-specific chemical modification. Journal of the Chinese Chemical Society 56: 987-994. (59) Chen YH*, Wang YH, Yu TH, Wu HJ, Pai CW (2009) Transgenic zebrafish line with over-expression of Hedgehog on the skin: a useful tool to screen Hedgehog-inhibiting compounds. Transgenic Research 18: 855-864. (61) Wang YH, Cheng CC, Lee WJ, Chiou ML, Pai CW, Wen CC, Chen WL, Chen YH* (2009) A novel phenotype-based approach for systematically screening antiproliferation metallodrugs. Chemico-Biological Interactions 182: 84-91. (62) Wang YH, Wen CC, Yang ZS, Cheng CC, Tsai JN, Ku CC, Wu HJ, Chen YH* (2009) Development of a whole-organism model to screen new compounds for sun protection. Marine Biotechnology 11: 419-429. (64) Wang YH, Li CK, Lee GH, Tsay HJ, Tsai HJ*, Chen YH* (2008) Inactivation of zebrafish mrf4 leads to myofibril misalignment and motor axon growth disorganization. Developmental Dynamics 237: 1043-1050. (65) Chen YH, Huang FL, Cheng YC, Wu CJ, Yang CN, Tsay HJ* (2008) Knockdown of zebrafish Nav1.6 sodium channel impairs embryonic locomotor activities. Journal of Biomedical Science 15: 69-78. (67) Chen YH*, Huang YH, Wen CC, Wang YH, Chen WL, Chen LC, Tsay HJ* (2008) Movement disorder and neuromuscular change in zebrafish embryos after exposure to caffeine. Neurotoxicology and Teratology 30: 440-447. (68) Tsay HJ, Wang YH, Chen WL, Huang MY, Chen YH* (2007) Treatment with sodium benzoate leads to malformation of zebrafish larvae. Neurotoxicology and Teratology 29: 562-569. (69) Chen YH*, Chen WL, Wang YH, Huang MY, Chern MK (2007) Spatiotemporal expression of zebrafish D-amino acid oxidase during early embryogenesis. Fish Physiology and Biochemistry 33: 73-80. (70) Chen YH, Wang YH, Chang MY, Lin CY, Weng CW, Westerfield M, Tsai HJ* (2007) Multiple upstream modules regulate zebrafish myf5 expression. BMC Developmental Biology 7: 1. (71) Lin CY, Yung RF, Lee HC, Chen WT, Chen YH, Tsai HJ* (2006) Myogenic regulatory factor Myf5 and MyoD function distinctly during craniofacial myogenesis of zebrafish. Developmental Biology 299: 594-608. (72) Lee HC, Huang HY, Lin CY, Chen YH, Tsai HJ* (2006) Foxd3 mediates zebrafish myf5 expression during early somitogenesis. Developmental Biology 290: 359-372. (73) Wang SL*, Kao TY, Wang CL, Yen YH, Chern MK, Chen YH (2006) A solvent stable metalloprotease produced by Bacillus sp. TKU004 and its application in the deproteinization of squid pen for beta-chitin preparation. Enzyme and Microbial Technology 39: 724-731. (78) Lin CY, Chen YH, Lee HC, Tsai HJ* (2004) Novel cis-element in intron 1 represses somite expression of zebrafish myf5. Gene 334: 63-72. (79) Chen YH, Lee HC, Liu CF, Lin CY, Tsai HJ* (2003) Novel regulatory sequence -82/-62 functions as a key element to drive the somite-specificity of zebrafish myf-5. Developmental Dynamics 228: 41-50. 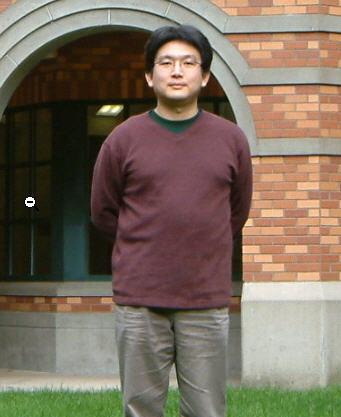 (80) Wang TM, Chen YH, Liu CF, Tsai HJ* (2002) Functional analysis of the proximal promoter regions of fish rhodopsin and myf-5 genes using transgenesis. Marine Biotechnology 4: 247-255. (81) Chen YH, Tsai HJ* (2002) Treatment with myf5-morpholino results in somite patterning and brain formation defects in zebrafish. Differentiation 70: 447-456. (82) Chen YH, Liang CT, Tsai HJ* (2002) Expression, purification and DNA-binding activity of tilapia muscle-specific transcription factor, MyoD, produced in Escherichia coli. Comparative Biochemistry and Physiology B-Biochemistry & Molecular Biology 131: 795-805; Erratum 133: 277-279, (2002). (83) Chen YH, Lee WC, Liu CF, Tsai HJ* (2001) Molecular structure, dynamic expression and promoter analysis of zebrafish (Danio rerio) myf-5 gene. Genesis 29: 22-35. (84) Chen YH, Lee WC, Cheng CH, Tsai HJ* (2000) Muscle regulatory factor gene: zebrafish (Danio rerio) myogenin cDNA. Comparative Biochemistry and Physiology B-Biochemistry & Molecular Biology 127: 97-103.